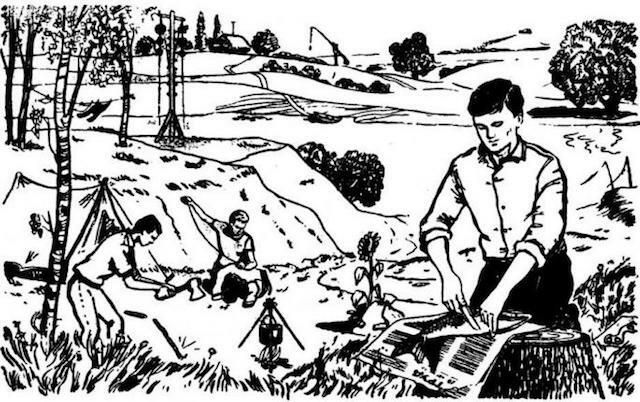 In addition to the entrance exam and knowledge test in the former USSR future agents had to solve puzzles like this one in the drawing. Can you pass the test! 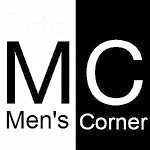 - Are these people experienced in camping? 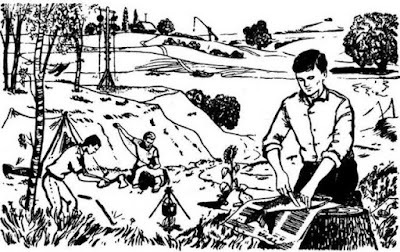 - Do they know well to keep the household? - Is the river in the drawing navigable? - Will the laundry take a long time to dry? - Will the sunflower long to grow? - How far is the first city from this camp? - In which city is flying the plane? - They're not experienced campers. If they were, would not set up tent in the valley! - Probably, but not excessively. You don't clean fish from the head, the button is not sewn long end, and the wood is split on the block, if possible. - The river is navigable. Visible is the navigation feature on the coast. - It will not. Because wind is carrying float hook upstream. - Looks like a sunflower is broken and stuck in the land - the flower is not facing the sun, broken plant is no longer growing. - Is not more than 100 kilometers away. If there is more TV antenna would be more complex. - It's not going to the city. It is an agricultural plane. What is the best beer, is very hard to write, so we will leave it for another time. What we can do is pull sales data, which really says a lot about the culture of drinking beer. Although many believe that the best-selling beer in America is Budweiser, results are slightly different. 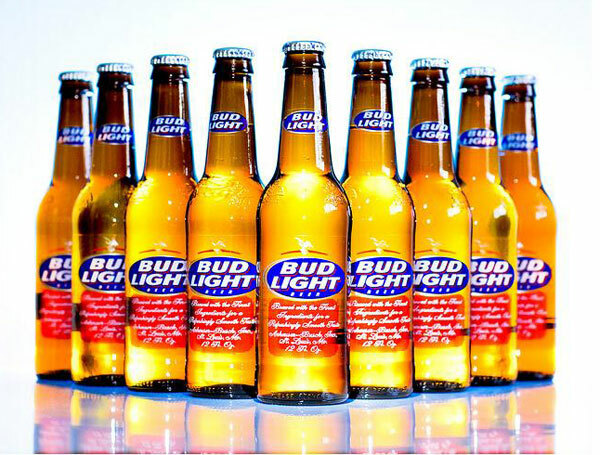 The best-selling beer is actually "weaker" version Bud Light, which is somewhat a national disgrace. So this data is actually since 2001, while the hardline Budweiser is on second place. 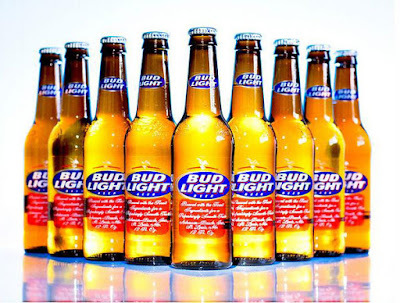 With 16% market share, Bud Light is one of the best-selling beer in the world, with distribution in just a few countries: Canada, Ireland, Mexico, Colombia and Sweden. 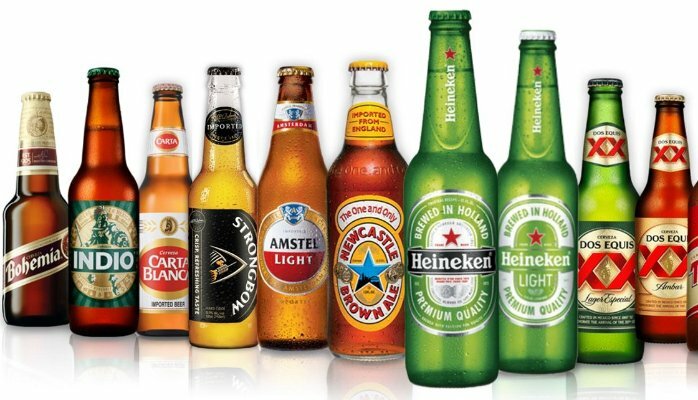 Budweiser, as already mentioned holding second place, while the companions of Miller Lite, Coors Lite and Corona Extra are very close. 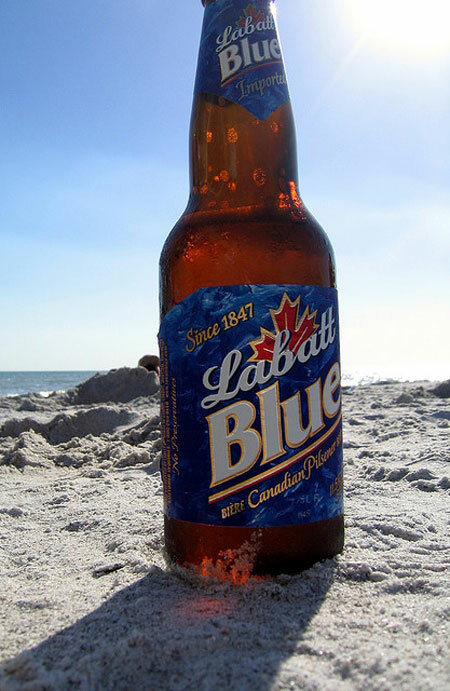 Canadians are very happy when they debate with Americans, whose beer is better, because they feel that they have a much better choice. No matter that currently the best-selling beer Labatt Blue is at least one step better than American say, what we are concerned about is that Coors Lite (American beer) slowly climbed to second place in the best-selling beers in Canada. The third is Molson Canadian. It's hard to connect beer with Brazil, but in the country with about 200 million people, you can find occasional fan of this divine liquid. 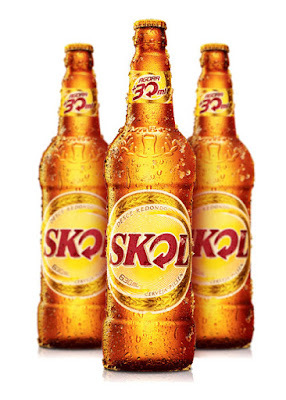 The largest part of the market takes domestic beer Skol (almost a third), while about 20% is related to Brahma, and third is Antartica, which takes 14% of the market. What is interesting that one company owns all three brands, and after mergers with several plants now called InBev. With Anhauser-Busch, InBev is the largest brewery in the world. Here is one country in which is very easy to guess which is the best-selling beer. 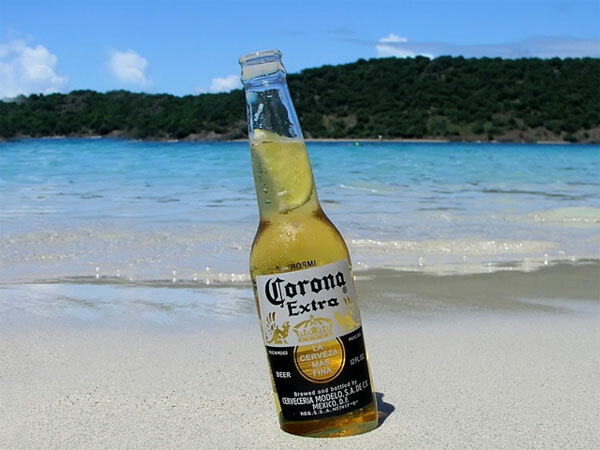 Of course, this is Corona Extra, which is also the top-selling imported beer in the United States. Exported to 150 countries worldwide and is responsible for increased sales of lemon in those countries. In second and third place are Dos Equis and Tecate, but they only collected crumbs of the strongest Corona. Since in Germany there are more than 1,300 breweries (second in the world), to choose your favorite beer, sometimes can be a problem. 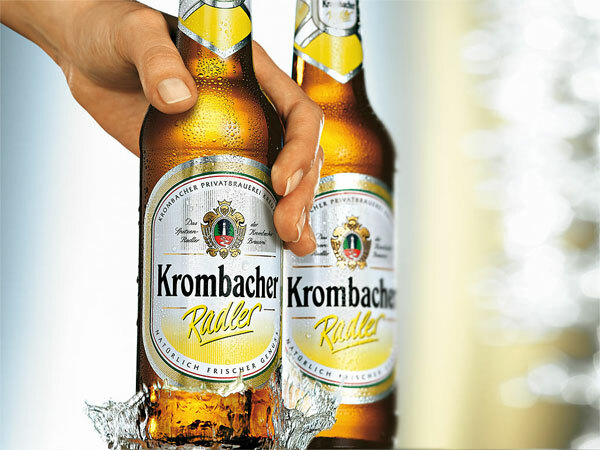 According to figures, Krombacher holds first place, while following Bitburger, Warsteiner, and Beck's (which is the German beer that is mostly exported). What is interesting with the German is their Reinheitsgebot law that even today prohibits the importation of beer that contain any additives other than water, hops and barley, even though it was ignored since 1987. 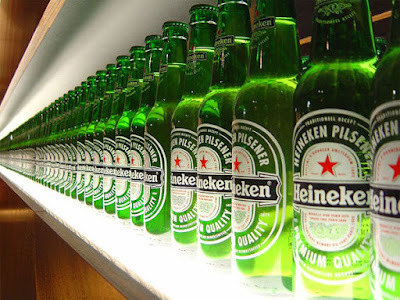 Another country that is famous for production of beer, Netherlands, and the country of which we know the best-selling beer, Heineken reigns supreme of beer market, while Amstel is in second place, but there is no place for panic because Heineken bought the brewery in 1968. Only in third place is the intruder, Grolsch. 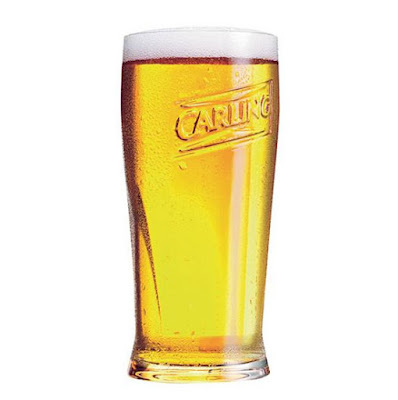 As advertisements at local cafes say, Carling is best-selling beer in the UK. 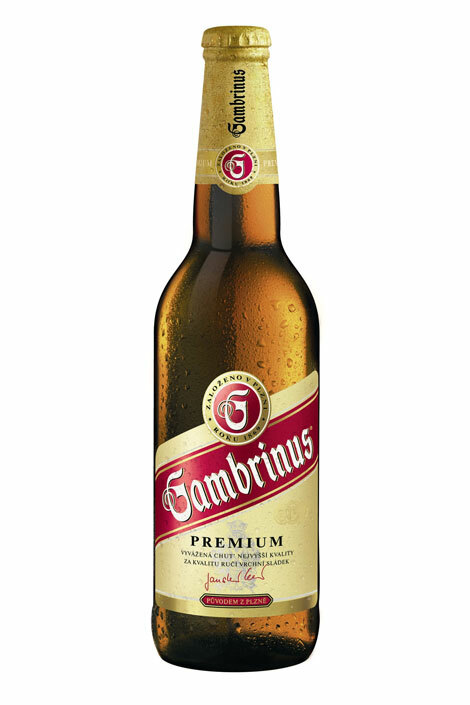 It was once called Carling Black Label and does not fit exactly in the world's most famous beer. Australian Foster's in second place, Belgian Stella Artois is third while the Danish Carlsberg is in fourth place. Carling actually comes from Canada, so we come to the conclusion that the British really like all import more than domestic. It is almost impossible to describe how Guinness rules Irish market. Perhaps correct information, that is slowly decreasing, but still holds more than 50% of sales. 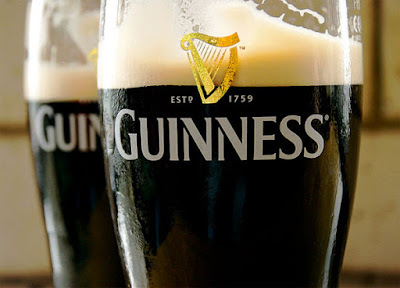 Fans say that Guinness is best in Ireland, just as it retains the freshness, while the manufacturer claims that it tastes the same in all 50 countries in how much is exported. The best-selling light beer is Harp, company Diageo, which is not accidental and owner of Guinness. 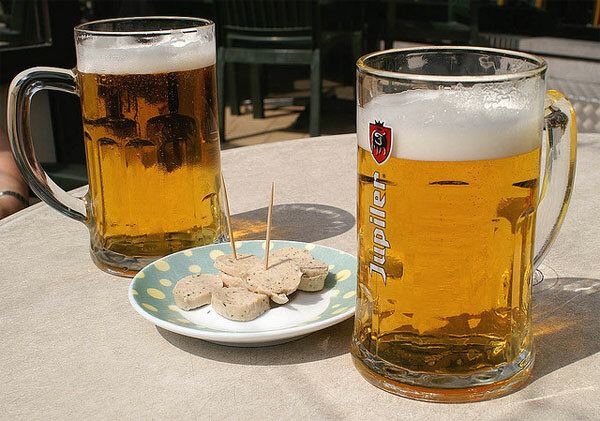 It's hard to imagine a trip to Belgium without having to try at least several types of beer. It usually starts with a little stronger Trappist Beer Monk, and easily set different beers mixed various herbs and orange peel. 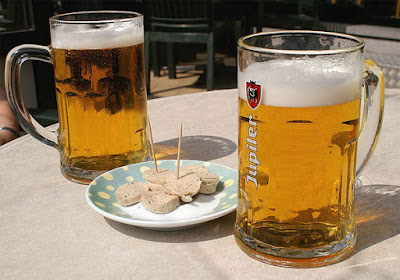 In Belgium, already mentioned InBev company rules, while Stella Artois best-selling Belgian beer in the world, but in domestic market holds only 8% of sales. With about 40% of sales in the first place is the Jupiler beer, but do not worry, there is no competition as this beer is owned by InBev. Czech Republic is the home of beer, so it is difficult to find a bad beer. Pilsner Urquell beer is best known around the world, but holds second place in the Czech market, while top spot holds cheaper brother Gambrinus. Both beers are owned by SAB Miller company and therefore are not in a conflict of interest. 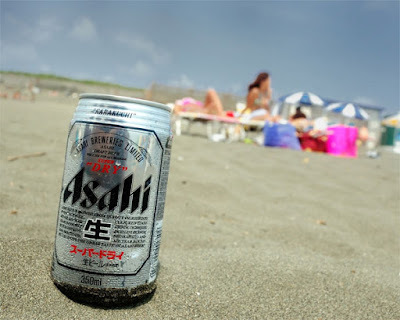 Maybe it does not seem that Japanese adore beer. Known Sake holds only 8% of the market while beer is consumed as much as 60% of the Japanese. In the first place is Asahi Super Dry, and is followed by Kirin, Sopporo and Suntroy. Japan is also known for appliances for a beer and a can of one liter, but for fear of minor abuse it slowly ceases to be used. Foster played a great advertising campaign so everyone convinced that their beer is just the best Australian beer in the world. The truth is somewhat different, so Victoria Bitter convincingly in front of the famous Foster. 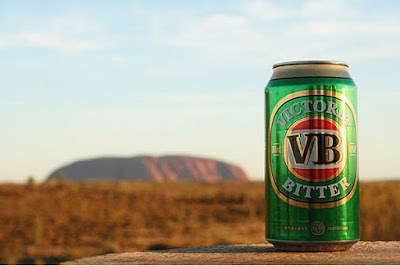 In fact, sales are very different in areas, around Sydney they drink Toohey's, around Melboruna Victoria Bitter and around Brisbane XXXX. According to the amount of beer drunk, China has surpassed the United States, although they have a quarter lower purchasing power than them. 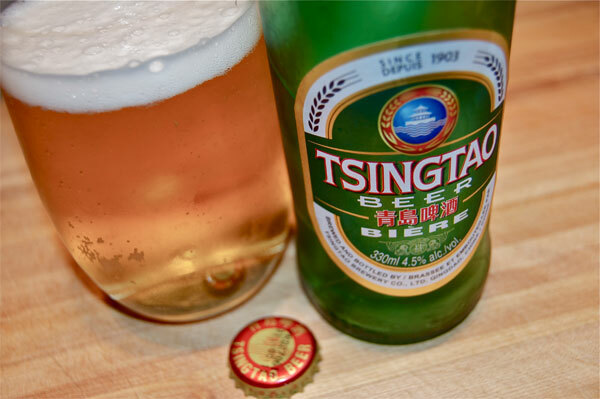 Of course, 1.3 billion Chinese people are thirsty and most like to drink Tsingtao beer, which is also a brand that is most exported worldwide. In second place is the Zhujiang, while the third is Ynjing. 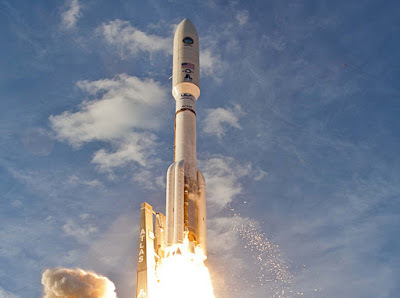 The US Senate reached an agreement to purchase 18 RD-180 rocket engines, because US companies are not able to make a substitution before the year 2021. 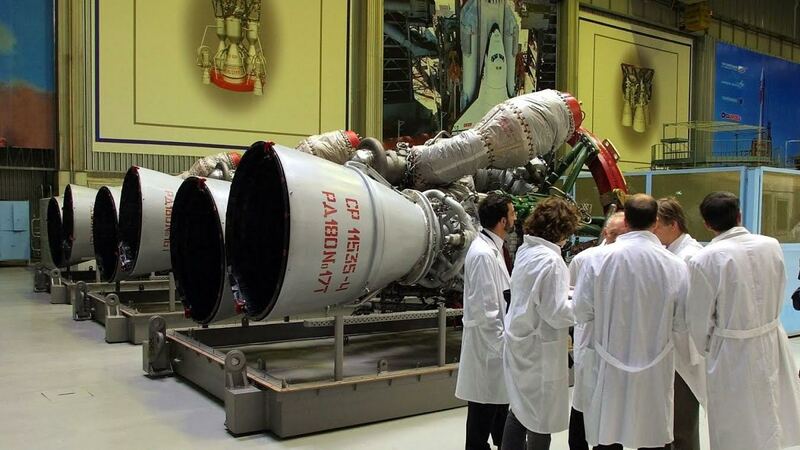 The US Congress in 2014 passed a law that requires the US to gradually break its dependence on Russian rocket engines. However, two years after putting a ban on the purchase of RD-180 engines, Congress was forced to lift the moratorium to allow the United States access to space. The two largest US defense contractors, Boeing and Lockheed Martin, use the RD-180 engine in their joint venture, the United Launch Alliance (ULA). The engine RD-180 are used for rocket "Atlas V", which the US Air Force used for the launch of its satellites, as well as for research programs of NASA. The US Senate reached an agreement to purchase 18 RD-180 rocket engines, said Senator Richard Shelby. "We agreed on this issue. The agreement is valid until 2022 and includes 18 rocket engines",said Senator Richard Shelby. The decision was preceded by a sharp debate on this issue between supporters and opponents of continuing the purchase. Earlier, Senator John McCain proposed to stop purchasing Russian engine and accelerate the development of American analogues. Support his initiative was provided by Congress. However, delivery is included in the budget law, which expires in October 2016. 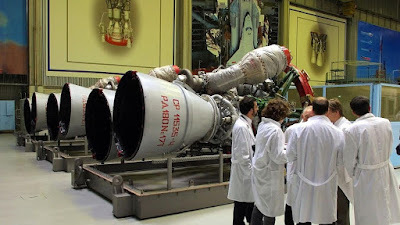 In the opinion of supporters procurement RD-180, stop buying Russian engine will lead to a loss of one billion US dollars and jeopardize national security. In addition, US companies are not able to make a substitution before the year 2021.